The city of Bandirma, situated in one of the most dynamic regions of Turkey, seeks to become one of the major gateways of a growing Turkish industry. The project site is located in the new thriving and expanding urban region of Bandirma, suggests and gives the opportunity of a new and innovative way of development, which takes into considereation the urban context and its principal elements: the built up area, the naturalistic park, the harbour and adjacent vehicular and pedestrian traffic. 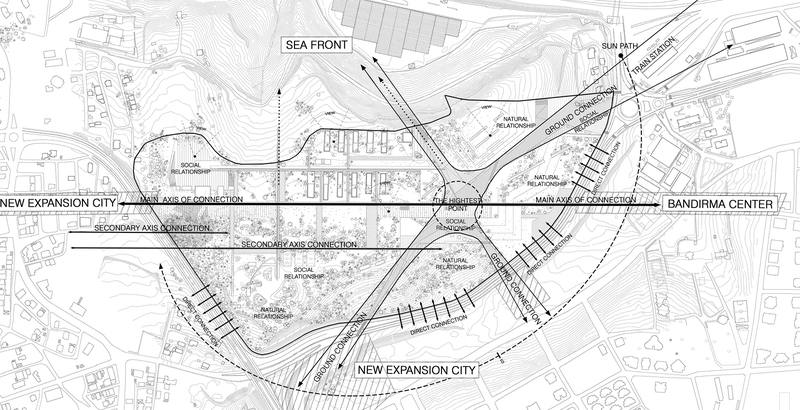 The proposal creates a new alternative concept for an open and dynamic public space. The shape of the site is greatly iconic and peculiar: the landscape is characterized by a particular morphology and it is covered with the large arboreal vegetation, mostly protected, which creates a unique and charming environment. Many pre-exsisting structures are dislocated into the area, partially-listed and bound, that have been used as a military storages for around 40 years, and were abandoned in the early 2000s. We greatly acknwledge that the existing architectural heritage and the unique characteristics of the natural landscape within the site are essential elements for the design and research process. In this context, the main goal of the project is to create a PUBLIC PLACE that can embody, at the same time, the evidence of the past and a starting point for future innovation, through the direct involvement of the citizens and visitors. The final result of a careful analysis of the site, the urbanity and the needs of the place, led to a project designed “in the folds” of the terrain, respecting and not denying them. An URBAN LANDSCAPE, therefore, linked to the history and traditions, but projected to the future of Bandirma, a perfect synthesis of the strong naturalistic character of the place, and the man made environment. The permeability and the community integration inspire the design process. 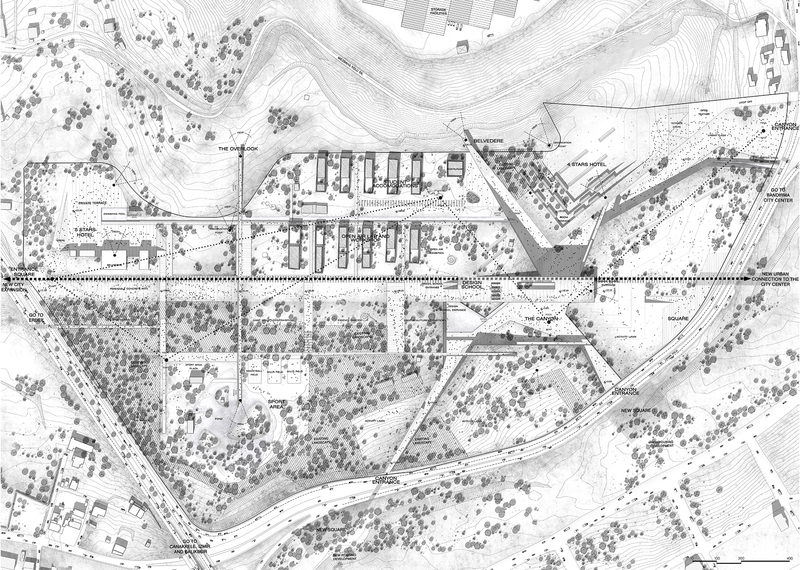 B.RE.A.K., Bandirma REgeneration As Knowledge, perfecty summarizes the design intent, which implies on the one hand the desire to propose a regenerative element for the city, and on the other, to use knowledge as a trait d’union between the people and the urban context. The concept of integrated architecture evolves: the landscape suggests the shape, drawn in its folds and interstices. The environment changes, and the architecture doesn’t seem to be a separate entity, but deals with all the factors and the relationship that surround it. Architecture becomes environment, simulating the topology of the area, recreating a primeval agreement with the forces of nature. At the same time, it becomes an ecological metaphor, facing the risk of environmental pollution and the reduction of the available energy; placing the architecture under the natural layer, allows a recover of the soil for other uses. Here then that it is necessary to create not a landscape dominated object. B.RE.A.K. is not built but rather ‘discovered’ by carving from the ground, in its wrinkles, in its steep slopes and highest points, fully integrated with the landscape, to get in touch deeply with the essence of that little piece of land on which it is called upon to intervene. The project basically consists in three different layers, organically interconnected, that work together to defin an URBAN GREEN SYSTEM, helping the integration between the city and its new expansion area. The first layer is the CANYON, a deep cutting that houses the principal functions, directly connected with the city. The second layer is the green roof covering the commercial lots and all the common areas in the project that generate a perfect harmony between the built up area and the surrounding environment. The last layer is the SYSTEM of PATHS, axis, water canals and public squares that allow and le t the users crossing throughout the area, designed getting back to the surrounding urban axis. These three layers are thought to work together organically, creating a PLACE FOR THE PEOPLE, a LANDMARK FOR THE CITY and a GREEN LUNG FOR THE ENVIRONMENT. It is a SPATIAL EXPERIENCE, to promote culture and knowledge, where to stay together enforcing the sense of comunity. The system obtained is that of a landscape carved, inclusive and introverted, which retains its essence, sculpted by sharp cuts that make it accessible and permeable to light and visitors. It entirely built under the portion of the land, that only leaves visible the natural element of the park, and the built line of the Design Institute. The proposal takes the shape of a rocky canyon, providing a respite for the city and its inhabitants,generating an Urban Square. 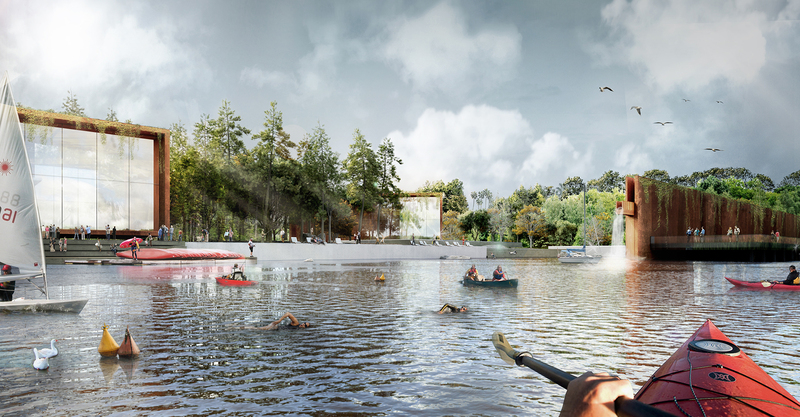 The proposal creates a flexible environmentenvironment, cut by green paths, trees and streams of water, that help to draw and organize it spatially. The canyon may accommodate temporary events, concerts or performances in the terraced steps, seasonal markets, open-air exhibitions. All around, the retail and commercial functions take place, to form an introverted urban system, which exsists within the urban square. They are reachable from all over the canyon, and also through the underground car park at the lowest levels of the system. Through a gently sloping ramp, it is possible to reach an overlooking terrace, which offers a vantage point on the city and the port of Bandirma. and spaces to the existing. Coming from the west side, and after the first public square, the 5 stars hotel is situated, with a space for gathering including conference and activity venues of various sizes. In front of the hotel a huge private terrace takes place, allowing guests and vistors to enjoy dramatic views of the Marmara Sea. On the other side, the protected trees form an enchanting woods, with a deep connection to the uncontaminated nature of the site. Going on, the pre-exsisting building volumes crop up one behind the other, completely refunctionalized; the recreational zone houses soccer fields, basketball fields,a small lake where for kayaking, fishing and other acquatic recreations. The lake also serves as a rainwater collection system, wich in return supplies irrigation for the proposals green zones. The recreational zone also houses expansive jogging paths for running with a large indoor gym for fitness. The entire green area includes site-specific works, temporary or not, to offer a spatial and cultural experience to the visitors. The main pedestrian exis is the the green roof of the Design Institute, completely accessible, that connects the two sides of the canyon. In the East side takes place the 4 stars hotel. This structure is designed to enjoy from any room the expansive views of the sea. For this reason the hotel is projected as a large steped architecture wih green terraces. All the rooms have a beatiful and large balconies that allow the users to enjoy the panorma and at the same time to shield the rooms from the cold winds. B.RE.A.K. Wants to “talk”, “tell” the naturalness and cast a deep bond with the place. For this reason, it makes use of a further natural element: water. In addition to pedestrian walkways and crossings, the water flows through all over the park, through small streams, confluent in sports small lake, fountains or pools of rainwater harvesting. Military pre-existing buildings, now reduced to only perimeter walls, are an integral part of the regeneration process: they, “skeletons” for the historical evidence of the city, are “filled” with new functions, back to being living places. Very simple box-like volumes are placed inside, to fill the gap of the old functions, and hosting, now, labs or open workshops, and temporary housing for students and visiting artists, to support knowledge, integration and sharing. The general image of B.RE.A.K. Is very earthy, with naturalistic elements such as sunlight, plants, flower, waterfall, and small lake. The inclusive design of the playground areas and the meaningfull design of green gardens, the park becomes a landscape for gathering, sharing, and family time for the community. As a symbol of knowledge achievements, the design of B.RE.A.K. ensures a flexible and efficient system, able to adapt itself over time, housing multiple functions, with a careful and organized planning of interior paths and orientation.The site is turned into a socially and environmentally sustainable green park, which provides areas for recreation, environmental education and social relations with the growing community. The project would face over time and to changing sourrounding conditions, adapting itself during the winter and summer time, becoming itself an example of sustainable design and construction practice. It incorporates the passive design strategies of natural ventilation, daylighting and solar heat gain, and all the positivities of the hypogeal architecture design. A very difficult challenge to face, was the fact that the site was exposed to the cold winds coming from the north, that in this case are shielded by the terraced volumes carved into the ground. The underground buildings, thanks to the thermal inertia of the soil, do not dissipate heat, ensuring indoor comfort in both winter and summer. Moreover, it is guaranteed the total permeability of the soil, since there are no buildings above the ground, and it is completely covered by green grass and trees. The materials used want to bring up with their color to the earth, and then point out the deep and indissoluble relationship with the natural essence of the place. B.RE.A.K. aims to be in the service of a large number of design schools in its region, becoming an open platform hosting exhibition, experimentation and research in collaboration with all design and art schools in the region. It will facilitate a creative environment in which fundamental knowledge of design processes is generated, shared and experienced. 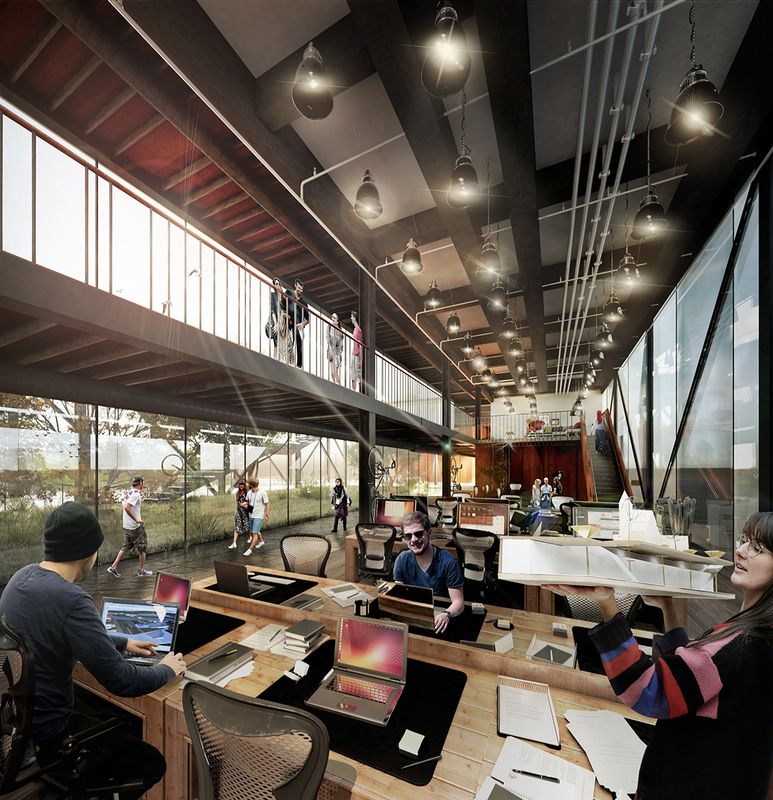 The proposal houses the Design Institute which aims to create a place where the design faculties from the vicinity can gather, organize meetings, collaborative workshops, symposium, debates. Again, a place for experimentation, innovation and creativity. The Design Institute is the only architecturally expressed, placed above the carved system and the green surface of the park. It is designed as a real pedestrian pathway, that emerges from the earth, standing above the canyon. It has a clearly expressed public behaviour, with a continuous and connected spatial structure, joined by a foodbridge which allows full accessibility. Supporting public functions are, however, organically arranged inside the park, to let the diverse set of activities be distributed throughout the site. They are organized through open, semi-open and enclosed spaces accommodating production, experimentation and exhibition. The whole green area is the scene of open-air exhibitions, both permanent and temporary, throught wich visitors can walk and stand (totally open and freerly accessible); the architectonical pre-existences are converted to labs and students accomodations (semi-open structures); the Design Institute, finally, includes the functions required, with a high degree of public accessibility. The Design Institute, located in highest part of the site, is defined by a bridge structure, linking the two sides of the canyon: it is a great vierendeel system, with a green walkable rooftop, and transparent perimetral windows that allow an uninterrupted visual connection with the surrounding environment. The main access is through the large side ramp, an extension of the superficial principle pathway of the park, as well as vertical connectives from commercial functions around the canyon, place at the ground floor. The main hall welcomes visitors, teachers and students from all around the counrty and the world, and it is completely opened through the metal large doors. The bookshop, also accessible from the pathway, and the cafeteria, that has a private outdoor area, overlook the public hall. From that the main distribution path runs, remarked from above by the aerial walkway, around which are flanked inner functions, interspersed with ateliers and open space workshops. The inner space is characterized by large double height open spaces, with tall empty walls let as blank canvas where to paint and sketch. In the middle is placed a vegetable garden, open to the outside, where to stand or lay down, and where is placed a steel staircase to reach the walkable green rooftop. The first level floor, which is reachable from the vertical connections and internal stairs, houses the offices of the park, four combinable lecture rooms, ateliers and the library. B.RE.A.K. Is an organically integrated green urban system, acting as the generator of the future transformation of the city of Bandirma, preserving the site ecology, historical and cultural heritage. 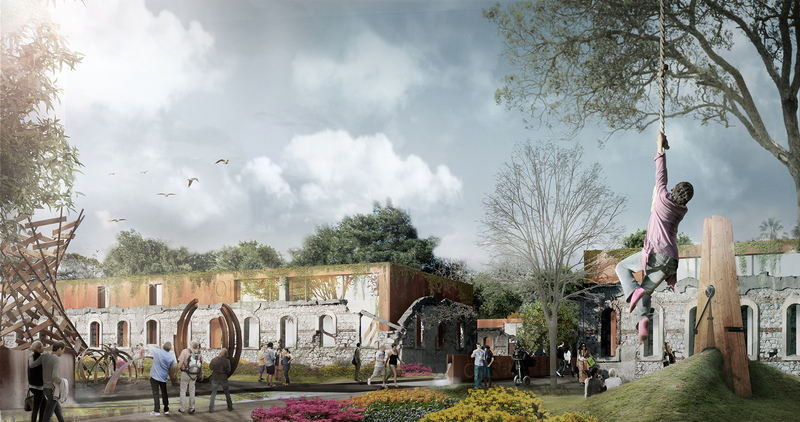 The proposal gives back to the city the area of the green park, organizing it with pahways, meeting places and public squares, enhancing the relatiships between the people. The site primarly houses the Design Institute function, that will attract a large number of design schools in the region, hosting exhibition, experimentation and researches. Again, a place for experimentation, innovation and creativity. The canyon at the ground floor is a direct connection to the near context, becoming a real Urban Square. It is surrounded by the retail and commercial functions, and it may house temporary events, concerts, seasonal markets or open-air exhibitions. The project offers a recognizable and iconic landmark to the city, also because of its location, in a pivileged observation point, between the harbour and the city. B.RE.A.K. 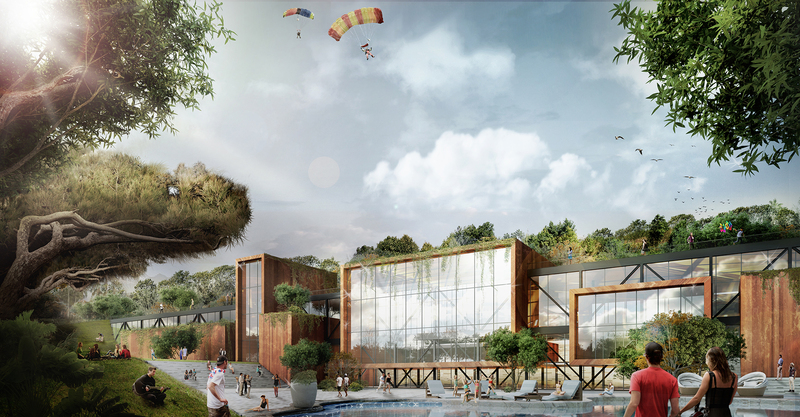 seeks to become a socially and environmentally sustainable green park, which provides areas for recreation, environmental education and social relations with the growing community. A symbol of sustainability, not only for preserving energy and using passive solutions, but also for enhancing the relationship between the people and the urban/natural surrounding.